Use of Site The information contained within this site is offered solely for your consideration. It is not to be taken as a warranty or representation for which Coast Dental Services, LLC or any of its affiliates assumes legal responsibility, nor does Coast Dental Services, LLC or any of its affiliates grant permission to use or practice anything contained therein, or recommend such use or practice. Please note that Coast Dental Services, LLC is not responsible for the content or activities associated with any site or entity that is linked to this site. Copyright Copyrights for the materials contained in this site, including all text, graphics, and photos, are owned or licensed by Coast Dental Services, LLC and its affiliates, 5706 Benjamin Center Drive, Suite 103, Tampa, FL 33634, USA. All rights reserved. 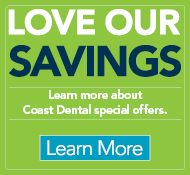 The use, reproduction, and/or re-transmission by any means of any of the material contained in this site without the written permission of Coast Dental Services, LLC is strictly prohibited. If permission to use, reproduce or re-transmit anything from this website is granted, © Coast Dental Services, LLC must appear on every page of every document reproduced along with the statement “Permission to reproduce granted” and the date. No changes, edits or modifications may be made to any document reproduced with permission. Trademark The following are trademarks, service marks or logos of Coast Dental Services, LLC and its affiliates: Coast Dental, Smile Plus, C3, Coast Comprehensive Care, Your Smile Can be a Work of Art, Bright Smiles Begin at Coast, Our Smiles Are Everywhere, Own a Practice That Doesn’t Own You, We’ll Give You Every Reason to Smile, One Company Countless Opportunities, Coast Dental Advantage, SmileCare and Practice Made Perfect All the Advantages of Private Practice None of the Headaches. Under no circumstances may you alter, modify, or change these trademarks. Hidden text used by web search engines to find websites, also known as metatags, may not be embedded into your website using any trademarks or service marks of Coast Dental Services, LLC or its affiliates, whether those trademarks or service marks are registered or unregistered. Any such use will be considered trademark infringement and will be prosecuted. Any other trademarks or logos appearing on pages linked to this site are the property of the respective owners and/or operators of those sites. For additional information on these owners, please refer to the Legal section on this site. Links to Other Sites Links to third party websites on this site are provided solely as a convenience. If you use these links, you will leave this site. Coast Dental Services, LLC does not claim to have reviewed these third party sites in their entirety, nor does it control these sites. 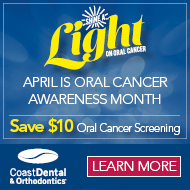 Coast Dental Services, LLC is not responsible for any of these sites or their content. Moreover, Coast Dental Services, LLC does not endorse or make any representations about any of the websites for which links are provided, or any information, software or other products or materials found there, or any results that may be obtained from using them. If you decide to access any of the third party sites linked to this site, you do so entirely at your own risk. Disclaimer THE MATERIALS PROVIDED AT THIS SITE ARE PROVIDED "AS IS" WITHOUT ANY WARRANTIES OF ANY KIND INCLUDING WARRANTIES OF MERCHANTABILITY, FITNESS FOR A PARTICULAR PURPOSE, OR NON-INFRINGEMENT OF INTELLECTUAL PROPERTY. Coast Dental Services, LLC further does not warrant the accuracy and completeness of the materials at this site. Coast Dental Services, LLC makes no commitment to update the materials at this site, even if out of date. Information published at this site may refer to products, programs or services that are not available in your country or region. Limitation of Liability IN NO EVENT WILL COAST DENTAL SERVICES, INC., ITS AFFILIATES, SUPPLIERS, OR OTHER THIRD PARTIES MENTIONED AT THIS SITE BE LIABLE FOR ANY DAMAGES WHATSOEVER (INCLUDING, WITHOUT LIMITATION, THOSE RESULTING FROM LOST PROFITS, LOST DATA OR BUSINESS INTERRUPTION) ARISING OUT OF THE USE, INABILITY TO USE, OR THE RESULTS OF USE OF THIS SITE, ANY WEBSITES LINKED TO THIS SITE, OR THE MATERIALS OR INFORMATION CONTAINED AT ANY OR ALL SUCH SITES, WHETHER BASED ON WARRANTY, CONTRACT, TORT OR ANY OTHER LEGAL THEORY AND WHETHER OR NOT ADVISED OF THE POSSIBILITY OF SUCH DAMAGES. User Conduct Subject to the Coast Dental Services, LLC Privacy Statement, any material, information or other communication you transmit through this website will be considered non-confidential and non-proprietary. Coast Dental Services, LLC will have no obligations with respect to such communications. Coast Dental Services, LLC and its designees will be free to copy, disclose, distribute, incorporate and otherwise use the communications and all data, images, sounds, text, and other things embodied therein for any and all commercial or non-commercial purposes. You are prohibited from transmitting to or from this site any unlawful, threatening, libelous, defamatory, obscene, pornographic, or other material that would violate any law. No patient identifying information is to be shared or transmitted to this site. Each party to these Terms and Conditions of Use submits to the exclusive jurisdiction of the state and federal courts sitting in Tampa, Hillsborough County, Florida, for any dispute with Coast Dental Services, LLC or its affiliates, subsidiaries, employees, contractors, officers, directors, telecommunication providers, and content providers. Revisions Coast Dental Services, LLC may revise and update these Terms and Conditions of Use at any time. Please review the terms, conditions, and privacy statements posted on the Coast Dental Services, LLC website each time you enter. Continued usage of the Coast Dental Services, LLC website will be considered acceptance of any changes. Certain provisions of these terms and conditions may be superseded by expressly designated legal notices or terms on particular pages at this site. Entire Agreement Except as expressly provided in a particular "legal notice" on the Coast Dental Services, LLC site, these Terms and Conditions of Use constitute the entire agreement between you and Coast Dental Services, LLC with respect to the use of the website and content.